In the Kitchen with Hawaiian Food Shack! CHEF Tim Schafel and owner Randy Padin-Wildman have been working together for as long as they can remember. I mean that literally. We all sat together at a table in their new-to-Ocean-City restaurant Hawaiian Food Shack on 11th and Asbury. After recognizing their close friendship, I asked, “What was the name of your first restaurant together?” Randy responded, “uhhh..that was 1998…hmm… what WAS the name of that place?” Chef Tim laughed while seemingly looking back fondly on their years together. There are so many amazing dishes on the menu. The Aloha burger comes with fresh, grilled pineapple and a sweet, tangy barbecue sauce that seems to be the perfect pairing. But the one thing my eyes kept taking me to on the menu was the lobster mac and cheese. Apparently I am not the only one who has this menu experience. 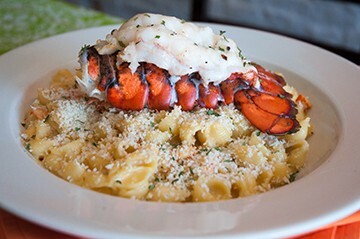 The lobster mac and cheese with fresh lobster tail and crispy breadcrumbs is a hit with customers. Both Chef Tim and Randy, clad in “Aloha in Every Bite” t-shirts walked me back to the kitchen to start making the lobster mac and cheese (on trend these days in restaurants). Chef pulled out a fresh lobster tail and cracked it open. I was happily surprised by the amount of lobster meat. This is going to be fun. So now what? We are going to put this in a very hot oven for 8-10 minutes. Okay, if I tried to make this at home I’d be afraid to ruin an expensive piece of fish. How do you know when it’s done? The lobster will be firm to the touch and not translucent. The shell will look more orange and the meat white. I notice you are heating a pan on the stove top. What are you doing with that? Heating up some raw butter for the other lobster meat. I’m going to throw three to four ounces of lobster meat into the butter to make sure we bring out the flavor. I am sautéing just for a minute because it’s already cooked. I’m also going to add some white wine which will cook down and add some flavor. In order to prep for this what are the best things to do? Well we want to make the macaroni shells, have some cooked lobster on hand and of course make your cheese sauce. We are definitely coming back to the cheese sauce, but I should focus. You are adding the macaroni shells to the pan. Yes. I am adding the cooked shells to the pan with the butter and cooked lobster meat and tossing it around a little bit. And now we add the cheese sauce. You have to tell me how to make it. Well, the cheese sauce is sort of a house specialty. Ah, I see. Well I won’t push you for the recipe. BUT if I wanted to make my own cheese sauce at home, how would I do it? Start with a roux for sure. You have to. Start with flour, butter and some milk. I like American cheese, parmesan, a sharp cheddar. I have experimented with cooper sharp. The cheese sauce here is five cheeses. It’s very popular. I can imagine. Who can say no to a cheese sauce? So, are those bread crumbs? This is an important part of the finish to the dish. I am emptying the pan with the cheese sauce and lobster meat to the plate. And now I am reaching in and grabbing some panko bread crumbs to sprinkle on top. This is a good amount, probably two to three tablespoons or so to cover most of the shells. Using the oven that is already nice and hot from the fresh lobster in there, I am going to put the dish with the breadcrumbs in to get them nice and crunchy. You just pulled the lobster tail out and put it back in the oven. Why? Not quite done yet. You want the shell to be nice and orange, and the meat to be firm. This was just a little soft to the touch and felt spongy. Okay, great tip. Are we almost done? Just about! I am going to pull the dish out with those breadcrumbs, add the cooked lobster tail to the plate, and sprinkle some fresh, chopped parsley all over the top. You can even use some chopped chives.